Apple is preparing an update that will improve performance of the Touch ID sensor on its iPhone 5s handset, claims AppleInsider. Apple has tapped its AuthenTec team to eliminate “fade”, a term coined to describe the increasingly erratic performance of the fingerprint sensor that is experienced by some iPhone 5s owners. Issues with Touch ID surfaced shortly after the iPhone 5s was introduced, with owners reporting an increasing number of failed scans shortly after they enter their fingerprints. Deleting and rescanning a fingerprint only temporarily fixes the issue. This is definitely a wide-spread problem. In fact myself and my good lady have both felt the need to ‘retrain’ the finger print record multiple times since purchase. We both often just unlock our iPhones by typing our pass codes in rather than using the finger print recognition. Apple definitely needs to improve this, so it’s good to see a potential fix is coming. The perfect phone for people with no taste. Garish design — both hardware and software. The gold version (shocker) is exactly what made people cringe when the gold iPhone was first rumored. Water-resistance is a legitimate step forward in the state of the art, though. I know there’ve been other water-resistant phones, but none that will sell as well as the S5. This is one area where Apple is behind. A good solution to this problem, though, has got to involve something better than a flap over the USB port. When you buy a 16GB iPhone 5c, you get 12.60GB of storage space left over after taking into account iOS 7’s default install size. Comparatively, the Samsung Galaxy S4 was the worst bang for the buck, storage-wise, in smartphones: a paltry 8.56GB of internal space was available to the user to store apps and media upon. Even the S4, though, was roomy compared to the newly announced Galaxy S5. A 16GB Galaxy S5 comes with less than eight gigabytes of usable memory. And what you can see is that on the 16GB model of the Galaxy S5, half of the on-board storage is used up before the owner even turns on the phone. It’s not quite as dire on the 32GB model of course (and remember that there’s a little bit of funky math anyway, and you never get as much storage as manufacturers say), and Samsung will quickly tell you that’s why you have the option to use a microSD card for expanded storage. Which is true! You can install apps, media and more to the card in the Galaxy S5’s microSD slot. But they will never run as quickly or as well as they run on the Galaxy S5 itself. At the end of the day, a 16GB Galaxy S5 only has 7.86GB of usable storage to play around with. WhatsApp, the popular messaging service that was recently bought by Facebook, is adding a big feature in a few months: voice calling. During a keynote at Mobile World Congress, WhatsApp CEO Jan Koum announced that voice calling would be added in the second quarter of this year. The feature will be a free addition to the already free app. WhatsApp has 465 million monthly active users, which is 15 million more than Facebook. The service’s huge international presence (it’s the largest mobile messaging service in Korea, for example) also helps explain why Facebook paid $19 billion to own it. The company’s app is currently the 35th most popular on the App Store. Facebook says WhatsApp’s messaging volume is “approaching the entire global telecom SMS volume”, roughly 7 trillion message a year. Facebook obviously consider “approaching the entire global telecom SMS volume” and having access to every user’s mobile number a bargain at $16 Billion. Interesting to watch where they go with their services now.. 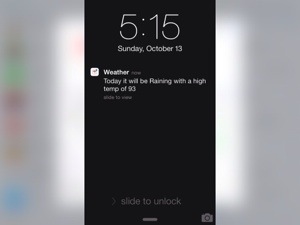 Weather Notifications is a fantastic app, simple in it’s design but works perfectly as advertised. There are dozens of weather apps on the App Store available to choose from ranging from powerful data-rich services to apps that show the current temperature as the badge notification on your home screen. 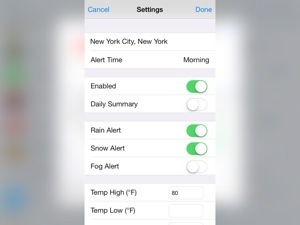 Weather notifications sole purpose is to send you a push notification of the weather at a chosen time for any given day. If you want more detailed analysis on the weather then as I said, the other apps are for you. If you just want a quick message, then it is perfect because I just want to know in 2 seconds what the weather is going to be like so I can then get on with the rest of my day. After downloading the app, I just went into the settings, set the City and what time of day I wanted the alert and that was it! Now every morning when I wake up and reach for my iPhone, it displays what the temperature will be and conditions for the City where I work for that day right on my home screen before I have even swiped to unlock it! Perfect for choosing the right clothes/jacket based on the weather for that day! The app is £1.49 and you should download it here.